Lane, formerly of Lakeland, Fla., and now residing in Guntersville, Ala., had another stellar day after weighing in 20 pounds, 8 ounces yesterday. His 5-bass limit weighed 23 pounds, 14 ounces, giving him a two-day total of 44-6 and the lead going into the final day of competition, but he said it wasn’t easy. Will Lane change his methods or locations in the final round? Even he doesn’t know just yet. Tim Frederick, the Day One leader, wasn’t able to match his first round magic, but his second round total of 38-11 was good enough to keep him in the hunt in third place. Clifford Pirch of Payson, Ariz., is second with 39-6. 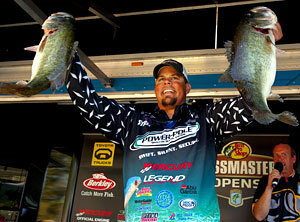 The day’s big catch belonged to Elite Series pro Keith Poche with 25-3. He’s optimistic about his chances on the final day. Poche is catching his bass on Lake Eustis using a shallow-running crankbait, targeting staging fish that are preparing to spawn. One angler who won’t be fishing on Saturday but already made his mark in the tournament is Jared Miller, whose 11-pound, 10-ounce largemouth took over big bass honors in the tournament. The fish is the largest ever weighed in BASS’ history on the Harris Chain. The previous best lunker weighed 11-1. Miller used a 7-foot, heavy-action Duckett Micro Magic rod, a Revo MGX casting reel and 20-pound-test Trilene 100% Fluorocarbon line to fish the jig. He didn’t use a trailer on the bait. Michigan bass pro Luke Gritter advanced to the final day sitting in 8th place with 10 bass weighing 31-12 after catching 15-5 today! Avery McCormick held onto his lead on the co-angler side of the competition with a two-day total of 26-7. The top 12 anglers on the pro and co-angler sides will move on to the final round tomorrow. The final round weigh-in will be staged at Bass Pro Shops in Orlando.